At this time of the year, the Yucatan scrub forest turns brown, smoke plumes erupt and Yuum Kin turns up the volume, scorching the earth and challenging all life forms to figure out a way to deal with the battering ram of heat that threatens to crush everything in its path. Here’s some tropical haiku on the subject. Yep, there’s a pyramid under that projection! Perhaps you have been reading about Uxmal on this blog, where the sugar coating comes off and the tourism rhetoric is saved for another day. Now it’s time for an update on the situation for foreigners trying to see the new ‘sound and light’ show at Chichen Itza. 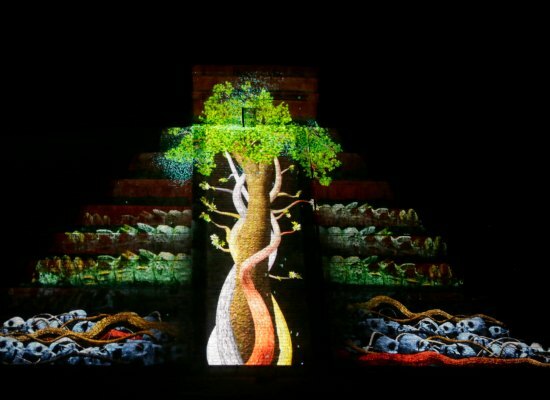 Why anyone would want to see the further Disney-fication of the Mayan culture let alone pay for the privilege is beyond me, but apparently there are some that do like to see colored lights on the altars and temples there, so here you go. This article is for people (foreigners) who are coming to Chichen Itza on their own, not from a hotel or a travel agency. Those situations require their own dexterities which are not covered today. 1) You must visit the office of Cultur (the Yucatan state agency in charge of Mayan ruins and administrator of the enormous cash flow that these sites provide) in person where you will be handed a ticket that contains a folio number. A website address is also provided for the next step. Be sure to take along ID in case you don’t look foreign enough. 2) You must then take the folio number and enter it on a web page on the aforementioned website. A confirmation screen comes up and you must print this page. Hopefully the website will be up and hopefully you will have access to the internet AND A PRINTER. 3) You then take the printed page (save our forests!) to the ticket counter at Chichen Itza where it is checked against a list for that day, to see if you are on it. If you are, hooray, you get a ticket and can go to the lineup where the ticketholders are waiting to get in to see the show. If not, well, all that previous work was for nothing. 4) Enjoy your walk to the area where you will witness this technological wonder, where you will be amazed by lighting effects splashed on the buildings. The show itself will last a whopping 25 minutes. 5) Enjoy the walk out, and back to your car. And the drive back to wherever you came from. I hope this post has been helpful to you, dear reader. Personally I could think of easier ways to grant access to a free show, most of which involve lining up and then letting people in, but I am hardly an expert in such matters. Rising is dangerous. Really? Physically rising? Socially aspirational rising? What if: When you arrived at Uxmal there was a welcoming smile at the ticket booth and not the burned out, Mr. Grumpy that currently received visitors who wait patiently in line? What if: The federal and state authorities were to make a leap of faith, move into the 21st century and trust modern computer and accounting software to divide the entry fee so that visitors could pay one ticket and not lineup for two separate tickets, sold side by side by two employees at two separate desks with two separate cash floats and to be punched by two separate employees at two separate ticket-punching stations? This archaic system works well for the government agencies involved, but is the purpose of Uxmal to benefit the government agencies and their accounting or is it to delight the visitor? What if: You could buy the ticket to enter Uxmal in less than 2 minutes? If there more than 4 people waiting, you can easily spend 10 minutes in the two lineups to get your two tickets from the two employees in the two windows. What if: If you did have to wait, you could do so in the shade? If larger groups are in line to buy their tickets, you will stand in the baking April sun thinking “is it really worth it?” while you feel trickles of sweat running down the small of your back. The employees are in the shade and so good for them. What about the visitors? Could they not at least have a canopy of some sort to stop them from literally burning? Would this not make their experience better? What if: You could choose the best guide and not the one whose turn it is? Some guides are better than others, some speak English better than others and some are better with children. But you can’t choose because there is a system in place that makes you take the next guide in line. Great for the guides – and I love them all – but is the visit to Uxmal about the guides having a fair distribution of clients, or is it about the visitor’s experience? 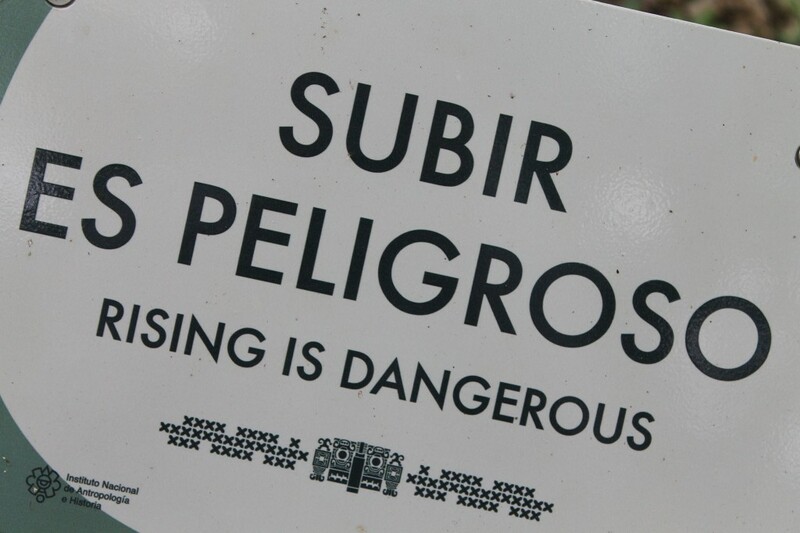 What if: They actually hired someone who spoke English to translate the signs warning people of the dangers in climbing the ruins and respecting the structures? Signs like “not sit” and “rising is dangerous” are toe-curling embarrassments to those of us who live here and take away from the magnificence of Uxmal. Hiring someone’s cousin who speaks no English to translate the signs obviously benefited someone – wink, wink – but how does this impact the visitor’s experience? What if the powers that be considered the visitors experience when they arrive in the Yucatan instead of spending millions of pesos on snazzy brochures and costly junkets to tourism fairs to promote the states attractions? Doesn’t magnificent Uxmal and all its grandeur deserve more than just to act as a cash cow for inefficient bureaucracies interested only in self-preservation? Ask yourself these “what if” questions on your next visit to Uxmal and think about how much better it could be. Is this the hospitality we want to show our guests when they arrive in the Yucatan? Yucatecans are famous for their hospitality. Is this really as good as we can be? This is worth watching, whatever your political convictions might be! If you have found this then you are on the new William Lawson Yucatan site! This will be the new repository for all things related to William Lawson and my take on life in the Yucatan, which dates from the NotTheNews days to the elmaloso blog to the Casual Restaurant Critic blog. This is over 10 years of writing about life here. Eventually, it will all be here. The immediate priority is to get the theme (the look of this WordPress blog) working, and then transfer content from the other online areas and sites to ‘populate’ this one. Sort of a one-stop for all things related to the topic of life in Merida or Yucatan, from a neurotic foreigners point of view. Comment at will and spread the word!